I’ve changed the front page to an artsy pic of the Seal of the President of the United States over the door of the West Wing by Flickr user Kyle Taylor. Found the location of the archived Bush 2 WhiteHouse.gov site. I’ve known for a while about the archived Clinton WhiteHouse.gov sites. A Georgetown University film class group is looking for a DC-area WH expert to do an on-camera interview about the recreational features of the WH grounds (tennis court, b-ball court, pool, etc.). E-mail me if you are interested in being put into contact with them. Peter Sharkey has come thru again with a beautiful floor plan of the East Wing second floor. To accompany it, I have posted pics of the Calligraphy Office. Joe Scarborough toured the West Wing press staff area today accompanied by an out-of-control nine-year-old girl and conducted by Press Secretary Robert Gibbs. It’s a great look at a seldom-seen part of the White House. Meanwhile, their friend Willie Geist poked around the old swimming pool and also the Press Briefing Room. While I’m at it, here is a tour Bill Plante did a few months ago (that includes the Kitchen, Pastry Kitchen, Family Theater, and Bowling Alley) that you may have missed (introduced by Chris Presumestoomuch). Thanks to everyone who sent links. I’ve added some new pics of those nooks and crannies I love so much, including the sub-basement Dressing Room, West Wing stairs, Navy Mess, and a photo of a photo of GWB bowling. Also, I’ve added a disappointed review of Oliver Stone’s W, a lackluster film which makes little attempt at portraying the White House accurately. 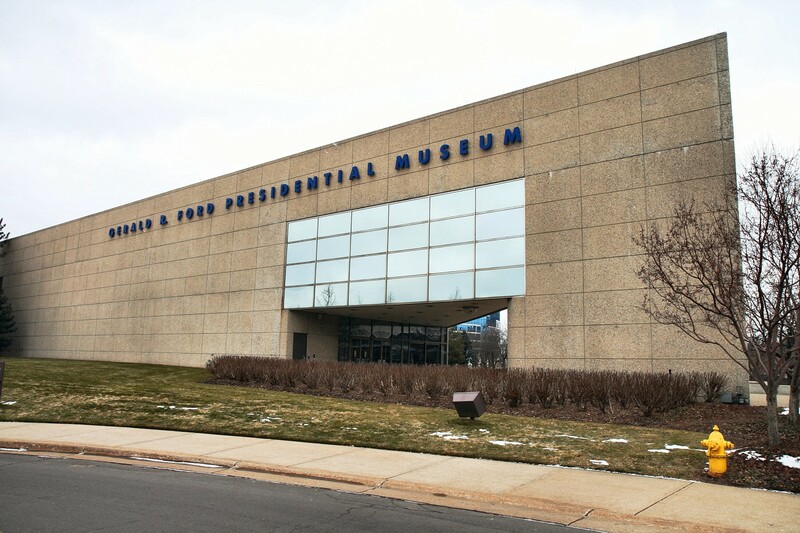 I managed to drive up to Grand Rapids, Michigan yesterday to visit the Ford Presidential Museum. I’m still processing the photos, including some I shot in 3D (you won’t need glasses). UPDATE: Pete’s floor plans look great and are a terrific addition to the White House in Miniature exhibit; they provide some context that is a little lacking. Find the photo gallery here.